I thought I would give a quick update on my Books To Read post that I did a few weeks ago. So far I am off to a good start. Setting the timer for 20 minutes a day has worked well and I have completed two books so far, both of which are food type books. There have been a few days that I did not read, or did not get the whole time done, but overall it has gone well. 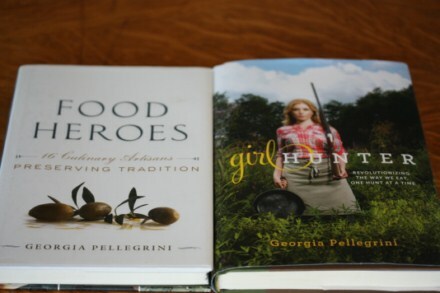 The two books that I finished were Food Heroes and Girl Hunter: Revolutionizing the Way We Eat, One Hunt at a Time and I really enjoyed both of them. Food Heroes was a fun and educational look into 16 Culinary Artisans. These 16 people are devoted to food and what they do. They love making and producing food the real way, the old way. They stay true to the food and what it is. They want to produce a product in its best form. From potatoes and tomatoes to salami and honey, these artisans love what they do and strive to do it the best they can. They have overcome many challenges to produce the products they do, but they continue to do it because they love it and are dedicated to preserving it. Food Heroes reminded me a bit of my childhood. We always had a garden. I grew up picking berries and mushrooms for money. My mom canned and preserved 600-800 quarts of food each year. For many years my dad raised honey bees and for awhile we bought goat’s milk from the lady down the road. Now my parents were not artisans trying to sell a product, but there are many similarities. Growing and producing your own food is a lot of work, but the end result is so worth it. When you really care about the product you are growing or making, it shows and the results are well worth the work. There is nothing quite like growing and eating your own food. And this book reminded me of why growing your own food and buying local can be so important. I also just finished Girl Hunter: Revolutionizing the Way We Eat, One Hunt at a Time . I really enjoyed this book. My dad hunted when I was a kid. Many of our friends hunted and still do. My husband, son, and daughter hunt. In fact, my fourteen year old daughter got her first deer last fall and we are currently enjoying the meat from it. So, hunting is not new to me and I am so glad that this book is helping to change the stereotype that hunting often has. This book is not a how to hunt book though. Girl Hunter is more stories about hunting. It helps you realize the connection that hunting and preparing food has with everyday life. I really enjoyed the way the author was not afraid of the whole process of hunting. She not only hunted, she also cleaned and cooked what she hunted. She really connected to the food and the whole process. She not only hunted it, she did the whole process of taking it from the woods to the table. And she shares a few recipes along the way. I will say that I bought this book with my daughter in mind since she loves to hunt, but after reading it myself, I am going to wait a bit longer to have her read it. There is nothing wrong with the book, but there are a few stories that involve some drinking and story telling by hunters that I think are a bit rough and tough for her right now. However, if she continues to love hunting this is a book I am sure she will read in the future. And I wish this book would have emphasized more the fact that many people need to hunt. There are people who hunt simply to put food on the table and to help feed their family. This was covered some in the book, but I think it could have been dealt with a little deeper. But again, overall I loved the book. And if you enjoy hunting, grew up with hunters, or have always wanted to hunt this is a book you will probably enjoy. I was inspired by your post a few weeks ago and have set a goal for myself to read 2 to 3 chapters a night. I also have a goal of 2 fiction and 1 non fiction book a month plus a non fiction to listen to while at work and driving. So far I have finished both my fiction books, Threadbare by Monica Ferris and Explosive Eighteen by Janet Evanoich. I am currently reading my non fiction book Girl Sleuth: Nancy Drew and the Women Who Created Her by Melanie Rehak. I have been listening to the Historical Conversations by Jacqueline Kennedy and I am halfway through the tapes. 🙂 Thanks for inspiring me to make goals and get back to doing something I love to do. Wow you are doing great! I am glad that I inspired you. Now if we can just both keep it up throughout the year. 🙂 I am hoping if I post updates once in awhile, it will motivate me to stay with it. I am also wanting to read more this year. I’ve finished “Winning the Food Fight” by Steve Willis. Each chapter covers a different aspect of food and how we battle with it almost daily. It covers nutrition, restaurant industry, government’s involvement, the spiritual side of food, family time at the table, and more. Definitely leaves you with plenty to think about and helps to make better decisions with our food choices! Highly recommend! You star! SO that’s how you are getting through them, 20 mins a day. I am so going to “schedule” myself reading time from here on. You did inspire me to write a 2012 book list which I did with recommendations from friends on FB, so no idea what my journey will be like … 😉 I did read my first book this week which was a simple read by Wanda E Brunsetetter (aren’t those Amish families fascinating) and am about to start The Red Tent by Anita Diamant today (during my 20mins … lol). The 20 minutes a day has been working really well for me. Having that set time really has motivated me to make sure I do it. And I am my post inspired you to read more and I am glad to hear that you are off to a good start.